Coffin of Ahhotep Tanodjmu. Nut outside the lid of the coffin. Early XVIII Dynasty. Photo: Metropolitan Museum of New York. Perspective in Egyptian art was special. For us, perspective is the representation on a flat surface of reality how it is seen by human eye. That means that observer is an important element when the artists paints or draw something. In Egyptian art the artists had to represent reality, not how it was seen, but how it was. The Egyptian artisan did not think about depth or vanishing point when drawing, because ancient Egyptian art was not made for being contemplated, but it had a religious purpose. However in some moment Egyptian art kept in mind the observer’s concept. When the anthropoid coffin appeared in Ancient Egypt, a new surface, with a new shape had to be decorated. This new object offered to the Egyptian artist different spaces for the iconography in the same object. 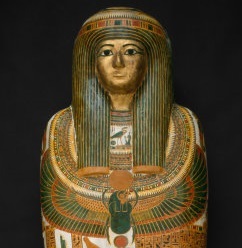 At the beginning the Egyptian artists drew typical motives as usual on the new coffin surface, as for instance the image of Nut all along the mummy. But later on the anthropoid coffin allowed the ancient Egyptian artist to adapt some typical Egyptian icons to the human shape, as for instance the winged scarab in the chest as if a necklace was. The feet space of the cover in the anthropoid coffin seems to introduce in Egyptian art the concept of the observer. During the Middle Kingdom and XVIII Dynasty this part of the coffin remained with no icons. Little by little, the decoration all over the lid increased and also the feet space was decorated. In some moment between XVIII and XIX Dynasties, Egyptian artisan noticed that a change of perspective was possible. While all the figures on the surface were drawn upright on the base line, the figures at the feet were sometimes drawn apparently upside down. Coffin of Khonsu. XIX Dynasty. From Deir el-Medina. Ancient Egypt. Photo: Metropolitan Museum of Art of New York. For instance in the coffin of Khonsu, from Deir el-Medina, and dating from XIX Dynasty, at the feet of the lid two solar icons were depicted in a different position from the rest of the images, or the coffin of Henutmehyt also from XIX Dynasty, where two female figures in the feet space were also drawn upside down. From the XXI Dynasty became common to include also in that way in this part of the anthropoid coffin the image of the two professional mourners. Why just on the feet were the image drawn upside down? Because they were depicted for the mummy; the dead was the only one who these image were depicted to.